We bought the bus tickets from Vientiane to Pakse from one of the travel agents, which once again turned out to be a mixed bag. On the positive side it seemed that the price was reasonable. On the other side we were surprised that we had to be ready for pick-up at 6 pm, while the bus didn’t leave until 8:30 pm. The ride to the bus station was only supposed to be around 10 km. Of course there is a reason for everything, in this case one that didn’t exactly cause excitment. 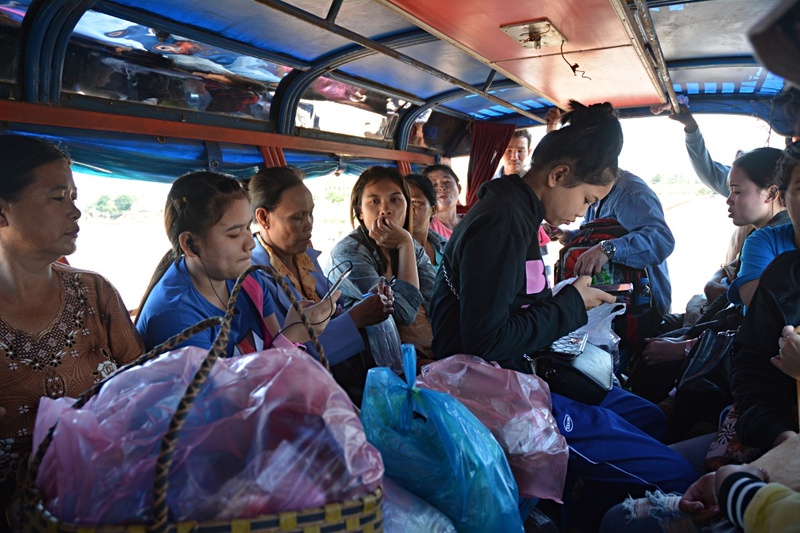 We started understanding what was going on when people headed for Luang Prabang to the north boarded the same shuttle. So instead of heading straight to the south bus station, the shuttle first headed out the almost 10 km to the north bus station through rush hour traffic and over bumpy roads before turning off onto the “ring road” and heading out to the south bus station. We arrived at the south bus station around 8pm, stacked up on supplies and took possession of our assigned double bed on the bus on the top in the very rear. Potentially as a result of our late arrival we got the last beds available on the bus. Fortunately a couple of Chinese travelers agreed to swap beds with us, which gave us an extra few centimeters such that we just fit into the beds. The ride was surprisingly uneventful and with more sleep than expected we were let go at the VIP bus station in Pakse, not far from the city center. Our first task was once again the search for accomodation. The ratio of price and value does not seem to be quite right in Pakse, however we finally found a nice room with balcony which just made our budget. We refilled our stomachs at an Indian restaurant near our guesthouse which offered sticky rice with fresh fruits. A welcomed changed from the ever-present noodle soup. 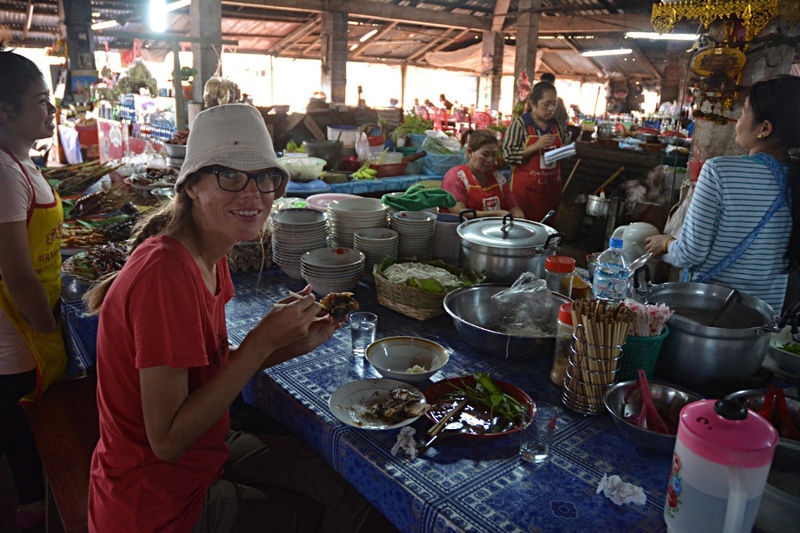 With full stomachs we started on a tour around Pakse. We found a beautiful Wat and what seemed to be a completely forgotten Hero’s monument. 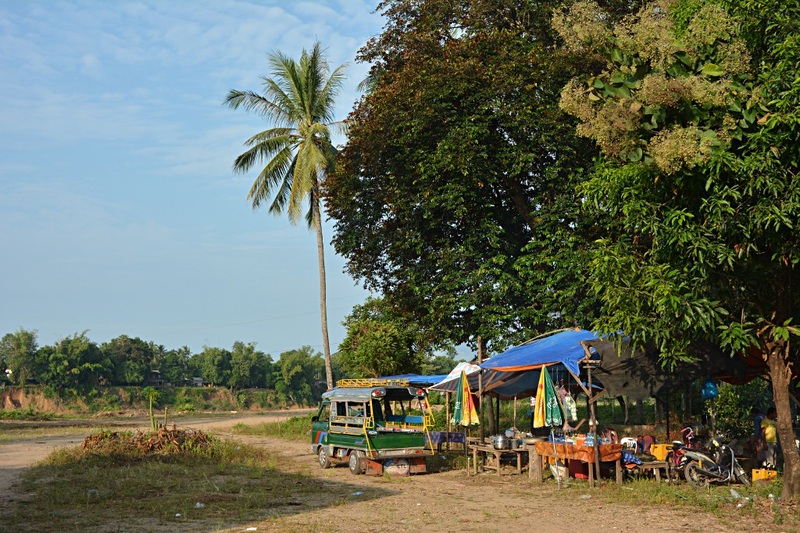 Finally we arrived at the market where we started asking around for transport to Champasak and the Vat Phu a pre-Angkorian ruin south of town. It turned out that the expected bus station actually was the gathering place for songthaews, small trucks with a couple benches on the flat bed, near the market. Once we started asking for options to Chmpasak we were immediately directed to one of the songthaews and about half an hour later we were on our way to the Vat Phu, fully loaded with bags of produce and people. It turned out that we sat on the means of transport for the local people to bring their wares they had purchased on the market home to their families. It was particularly interesting to determine what the restaurants where the bought products were unloaded offered on their menu. It was easy to guess when they offered noodle soup and papaya salad. Other dishes were a little bit more difficult to guess. We were lucky that apparently two more passengers who spoke English and Lao also were headed for Vat Phu such that we were dropped of right in front of the archeological complex. Somehow the two didn’t fit into the picture; on the one hand side they spoke fluent Lao on the other hand they were dressed like western tourists. Things started to make sense when we had a quick chat once we got off the songthaew. The husband explained in German with a very strong Swiss accent that he had lived in Zurich for 12 years and his family still lived in Champasak. So he was home for a visit! He was kind enough to let us know that there would not be any means of transport back to Pakse that afternoon, since people were home from the market and did not have a need to go back to Pakse. We were very confident that we would still somehow get back to Pakse and set off to discover the Vat Phu. Even though the ruin might be one of the most important from pre-Angkorian times, one should not expect anything remotely as impressive as Angkor Wat. Way smaller but nevertheless quite interesting and mostly in a very beatiful location the Vat Phu offered plenty of reasons to linger. Across the parading road, passing the Northern and Southern Halls we climbed up the mountain to reach the Buddha source. 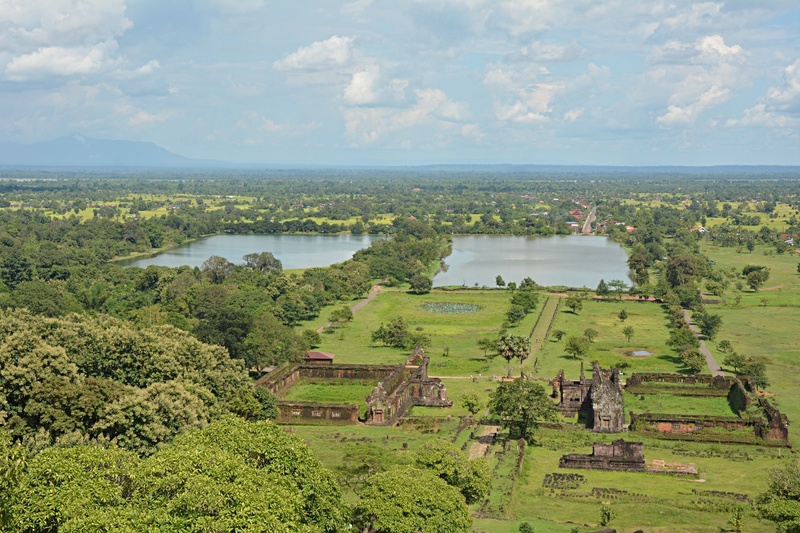 The view across the Vat Phu, the Mekong valley and of the mountains of the Bolaven plateau were breathtaking. While touring the place we spoke to quite a few other tourists and inquired what mode of transport they had used to get to Vat Phu. Most of them had rented a scooter, but Kjeld from Denmark and Nacha, his Thai wife, were an exception. They had hired a driver and a minivan and were more than willing to give us a ride back to Pakse. They even suggested to get some food in a beautiful little restaurant right on the banks of the Mekong river. Back in Pakse our paths separated and while we started inquiring how best to conquer the Bolaven plateau they enjoyed the night market in town. We didn’t come up with a conclusive answer so we decided to get up early in the morning the next day and instead enjoyed another cold, fresh fruit-shake. The next morning at 6 am our alarm clock pulled us out of our sweet dreams and we right away headed off to find a tuk-tuk which could bring us to the bus station for a ride to Paksong. For the first time in Laos we head the pleasure to ride in a side-car of a 125ccm motorbike. The two of us with our luggage proved to by quite a challenge for the small vehicle but fortunately we managed the small ascent in town. The driver dropped us off near the market where we had caught the songthaew for Vat Phu the day before and soon we were on our way towards Paksong. The driver made another stop at the new bus station, 8 km out of town, where we head a chance to pick-up some breakfast, before heading out to km 38 on the road to Paksong where we were dropped off to visit the Tad Fane waterfall. We learned that just opposite Tad Fane one could visit the less popular Tad Champee, another waterfall. 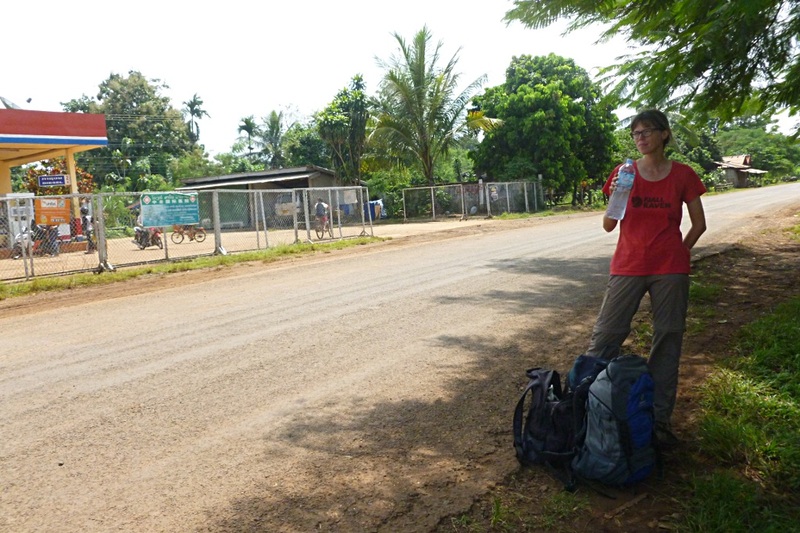 We walked the short stretch to the Tad Fane Resort, where we left our backpacks at the entrance gate. While the falls looked impressive from above we would have loved to see them from below, however the path proved to be too steep and too slippery, such that we turned around. 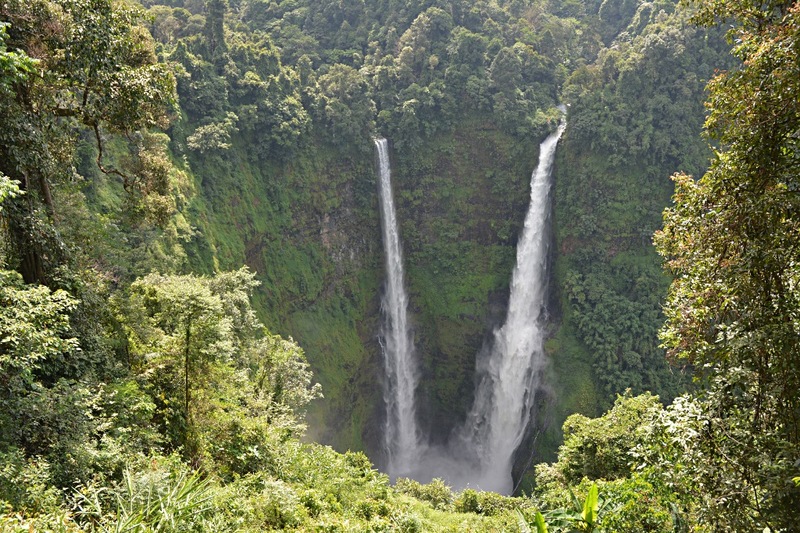 So we enjoyed the view of the waterfall which drops into a hole in the middle of a plateau covered in wild forest. Transport on to Paksong turned out to be absolutely no problem since a songthaew just stopped on the main road when we got there. We jumped on and managed to make the final 10 km to Paksong. 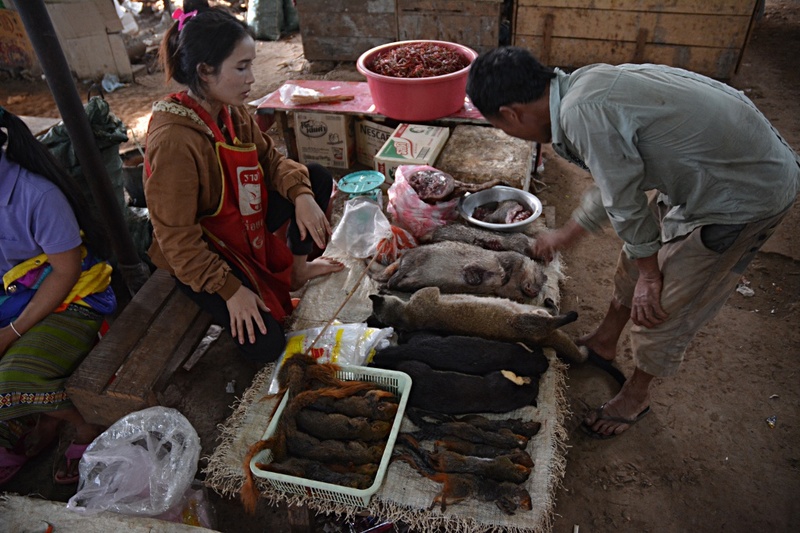 We were dropped off at the market where we first headed for the foodstalls where we combined a barbequed fish, a papaya salad and some sticky rice into a delicious meal. The loals enjoyed having some foreign guests for a change, although communication was limited to food selection and payment. Once we were refilled, we set off to a village and transport discovery tour. We had decided to try to continue on to Sekong in the afternoon if possible but at the same time wanted to see a little bit of Paksong. We walked down the main street and eventually ended up at the end of town. We placed ourselves at the turn-off for Sekong, but no vehicle taking passengers would stop to give us a ride for an extended period of time. We finally were picked up by two Germans who run a silk-farm near Tatheng. They dropped us off right in front of a nice little guesthouse in Tatheng where we decided to spend the night. Once more we had the chance to discover a little village market and ate some delicious local food for dinner. We had inquired for transport to Sekong for the next morning and learned that there was a bus at 9 am. We were happy not having to get up too early and enjoyed a small breakfast at the market before boarding the completely overloaded bus. We were lucky enough to get a seat on the plastic chairs which were placed in the aisle and didn’t have to stand like other passengers. After a little more than an hour we reached Seking bus station, again located a few kilometers from the town center. We didn’t hesitate and immediately jumped on to the only tuk-tuk at the station to catch a ride to town. In Sekong we tried to find a boat which could bring us to Attapeu some 5 hours downstream the Sekong river. Unfortunately the roads in Laos have improved so much in recent years such that there is hardly any traffic on the rivers anymore. There didn’t seem to be much of interest since the only quote we got was around 250 Euros for the ride. In comparison, a bus ticket across half the country sums up to about 15 Euros. So we opted for the bus instead to reach Attapeu. Through a lot of asking we eventually found the main road to Attapeu were the busses would pass. A nice gentleman confirmed that we were at the right place in front of his house and even offered us a couple of chairs to sit in the shade while we placeed our backpacks on the roadside to get the attention of any driver who would take passengers. We spent the next hour on these chairs, Lenka napping for a little bit and myself reading up on what lied ahead in our guide book. Suddenly we were pulled out of our respective activities when a bus honked up the road to signal that he could offer a ride to Attapeu. An hour and half later we pulled into Attapeu bus station where once again there was exactly one tuk-tuk waiting for local transport into town. We quickly inquired for onward bus connection before hopping on. We were dropped off at the same guesthouse where our co-passenger had made a reservation. We decided to shop around for accomodation which proved to be a quite challenging proposition. Most accommodations were full of either Vietnamese or Chinese visitors (it was still Golden Week in China). Finally we found a place to stay near the little town market and following the repair of the door lock we tried to get a little better impression of the town. Luckily we found a restaurant with free WiFi such that I could complete my blog post on Vientiane. 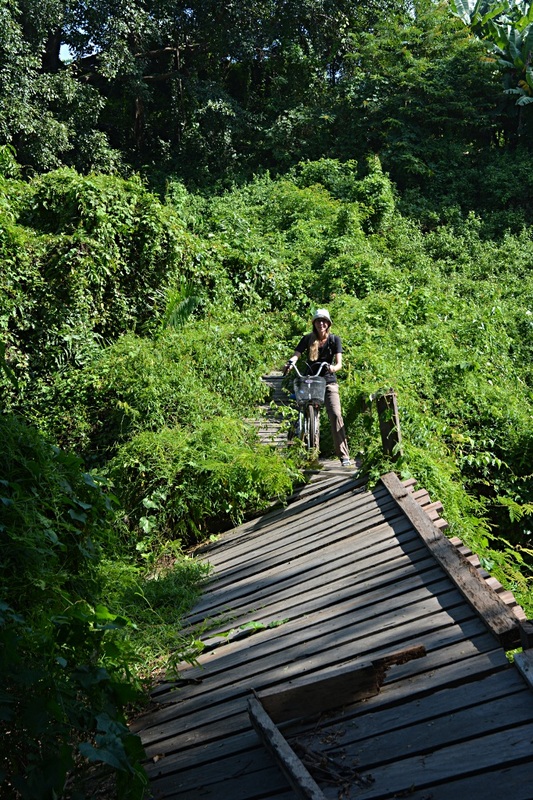 The one question that remained was how we would continue our journey around the Bolaven plateau. We had only seen Attapeu after dark, the buses for Pakse and Salavan were already leaving at 8 am and 9 am respectively and we had yet to discover the surroundings a little bit. We decided to check early in the morning whether we could find any possibility for an excursion in Attapeu. 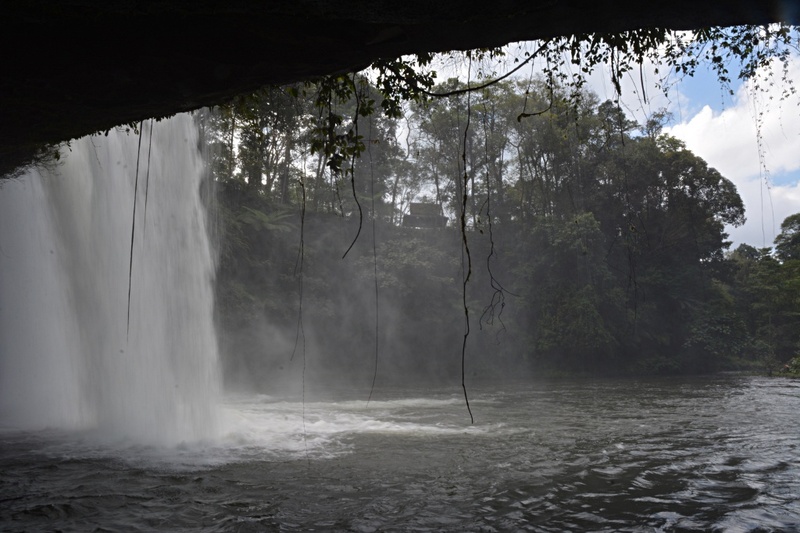 Should we fail to find a trekking opportunity, we would head out to the bus station for the 9 am bus to Salavan and jump off the bus to see the Tad Lo waterfall. Unfortunately Attapeu is not that developed touristically that we couldn’t find any excursion, so we went back to our guesthouse, packed our belongings and started walking towards the bus station. At an ATM we pulled a little more cash and soon after were picked up by the same tuk-tuk as the day before with the same passengers aboard. We thankfully jumped on but the journey almost ended in desaster. On a bridge an oncoming pick-up slowed down considerably. The motorbike driver behind him opted to pass at high speed only to be confronted with our tuk-tuk. Fortunately for everyone the motorbike driver and the tuk-tuk driver showed excellent reflexes such that a head on collision could be avoided. However the motorbike driver still got hurt as he hit the side of the tuk-tuk, causing only small damage on the tuk-tuk, but potentially large damage on the motobike. Immediately police was on site and only two minutes later we were on our way to manage the last 50 meters to the bus station. After this short shock moment we enjoyed a delicious breakfast at the bus station before we climbed aboard the minivan for Salavan. Roughly 3 hours later we climbed out again in Ban Beng, the turn off to Pakse and Tad Lo waterfall. Another 15 minutes later a songthaew stopped for a ride to Saenvang, the village near Tad Lo waterfall. We managed the remaining 1.5 km on foot and found a nice option for accomodation in a small wooden bungalow with a large terrace and a hammock. We packed our daypacks to take a peak at the waterfalls around the village, Tad Hang, Tad Lo and Tad Soung. While the first two were only a few steps from our accomodation, we failed to find the third one. All paths we could find heading in the direction of the waterfall ended somewhere in some rice paddies. We enjoyed the late afternoon sun amidst rice and headed back to our place, since the waterfall was still quite a distance away and chances were we would not make it back before nightfall. We took a short rest in our room at the guesthouse before we grabbed something small to eat from a couple of stalls near the wat. The village had organized a large live concert with several activities around. Unfortunately we only experienced the Lao roulette at which the players bet on numbers and animals. 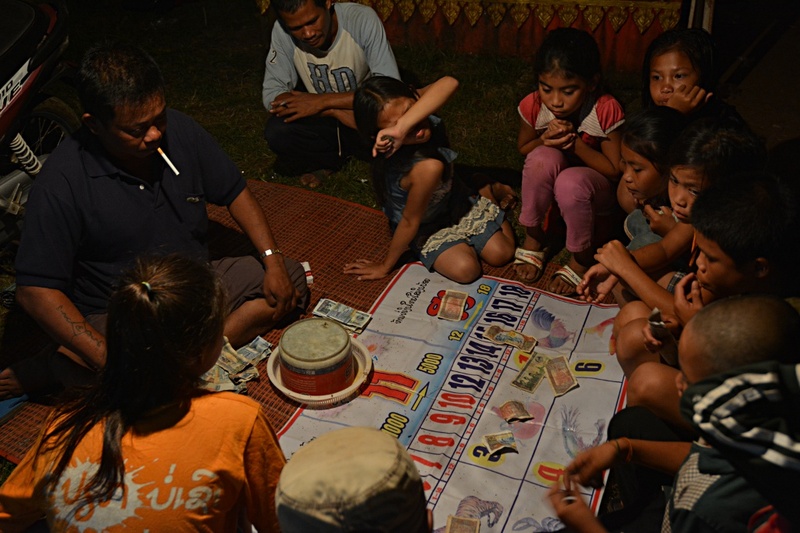 The croupier rolls three dice which each contain animals and numbers on each face. It was a quite a bit surprising to see small children bet on combinations using real money, sometimes even larger amounts. After the tour, which had taken a little more time than anticipated, we walked down to the main street and placed our luggage once again on the road side. We had to wait for about one hour until the bus stopped and picked us up. The bus brought us to the Pakse bus station. The bus driver explained that we could take a “same same” bus to Nakasang, which turned out to be a songthaew (“but different”). The 4 hour drive which was not meant to take more than 2 or 3 hours on the very much loaded vehicle left all passengers weary. When just before arrival the heavens opened up and a thorough downpour soaked passengers and freight, people were really longing for arrival. Finally we made it to Nakasang where we took the boat through night and rain to Don Det, one of the 4000 islands in this region of the Mekong river in the southern most tip of Laos. After an extensive search for a nice place, we found a nice bungalow on the sunset side of the island. As a little extra we even had two hammocks on the front porch at our disposal. 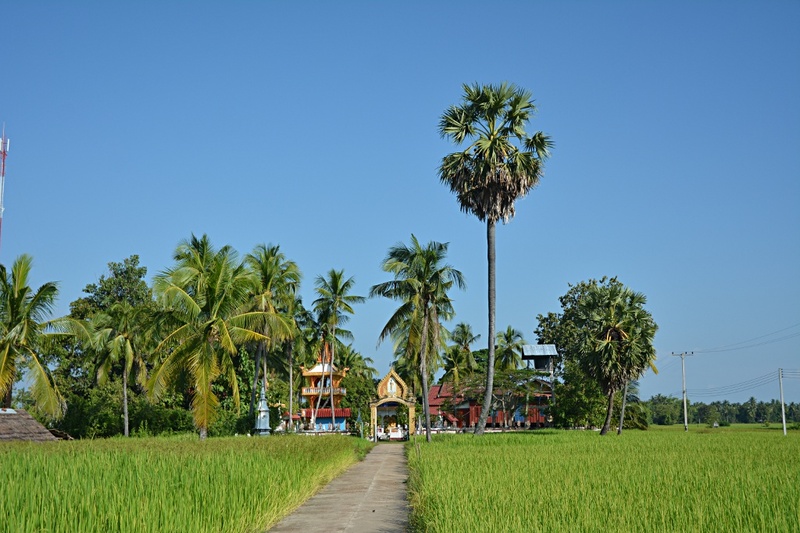 We spent Tuesday exploring Don Det and Don Khone, the two touristy islands, by bike. Going back and forth between the small islands was straightforward across an old railway bridge. When we first passed gthe railway bridge, we didn’t bother ti think about why there was a railway bridge on these two islands in the middle of the Mekong river. When we discovered an old locomotive along with the history of the railway on Don Det and Don Khone, it made things clearer. Apparently to tie Yunnan province to the French colonies, the French tried to establish a trade route along the Mekong river as an alternative to the British route along the Yangtze river. 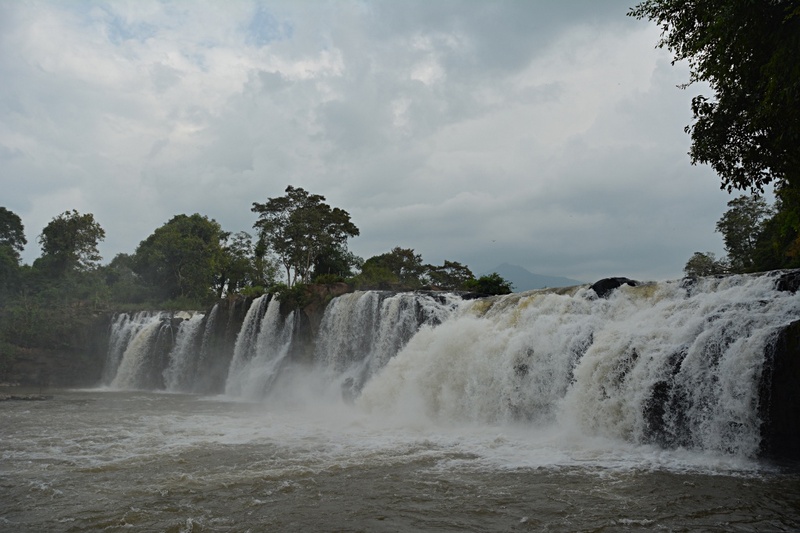 However the waterfalls and the 4000 islands in modern day Laos were to big an obstacle for any kind of boat. Therefore the French decided to build a railway line on these two islands to connect the calmer waters below the waterfalls with the calmer waters above. These days the former railway tracks are a beautiful road for cycling which is also used by small tourist buses for the lazy tourist. The return trip led us to the waterfalls near Don Khone Pasoy, where apparently catching fish is a big business. Across the whole waterfall big traps for migrating fish are installed to certainly not catch small gold fish, but rather the Mekong catfish. 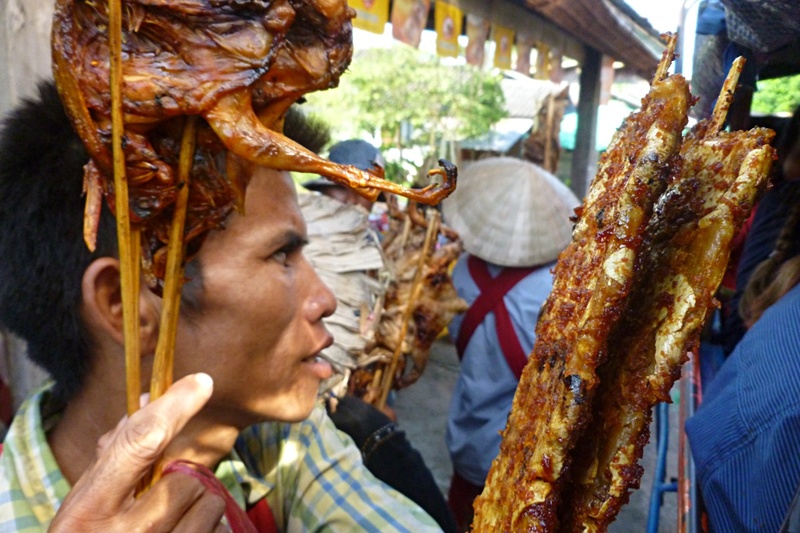 Small catfish on a stick from the barbeque definitely make for a nice snack as we can attest. Tired and quite thirsty we return in the late afternoon back to the northern tip of Don Det. 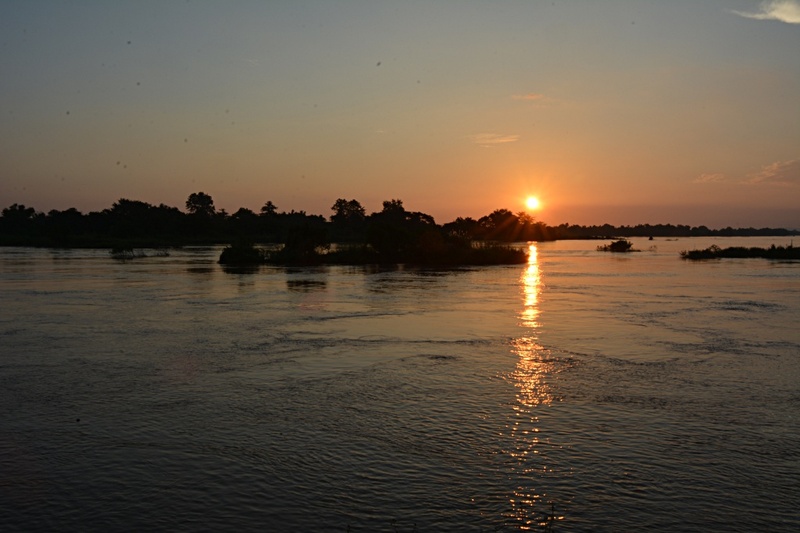 We were still in good enough shape though to enjoy a wonderful sunset across the Mekong river and to try a local specialty, Mok Pa, for dinner. The fish, well spiced and steamed for an hour in banana leaves, nade for an amazing closure of the day. Only the second restaurant where we inquired was willing to actually prepare the fish for us and the wait was well worth it. Once more we enjoyed an excellent dinner! A banana fruit shakes nicely complemented the day. 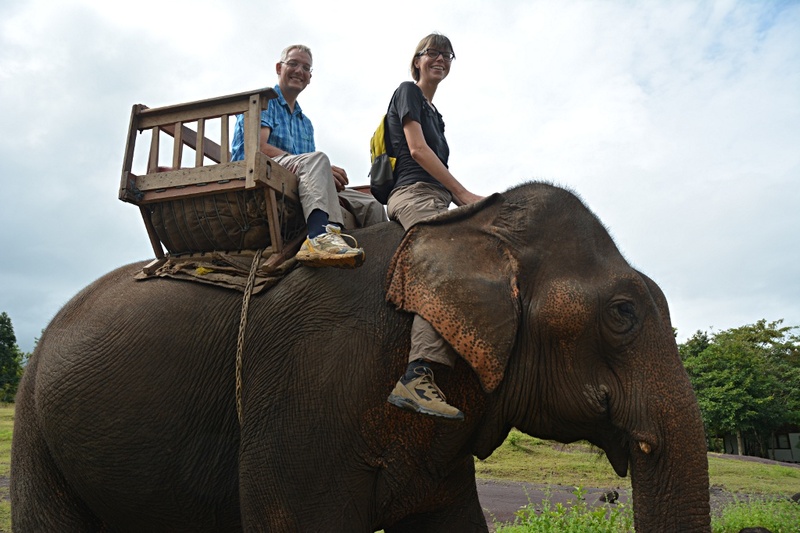 For Wednesday we had planned our last tour in Laos. By kayak we wanted to explore more of the beautiful region around the 4000 islands and potentially spot some of the endangered Irrawaddy dolphins in the southern most tip of Laos. Around 8:30am we were invited for breakfast to meet and greet all the participants of the tour. In our case this meant meeting 6 new faces, while apparently durign the high season there are up to 40 people on a single tour. After a short stroll along the main road we reached the dock of Don Det where we were handed paddels, life jackets, dry bags and a kayak for two to three people. 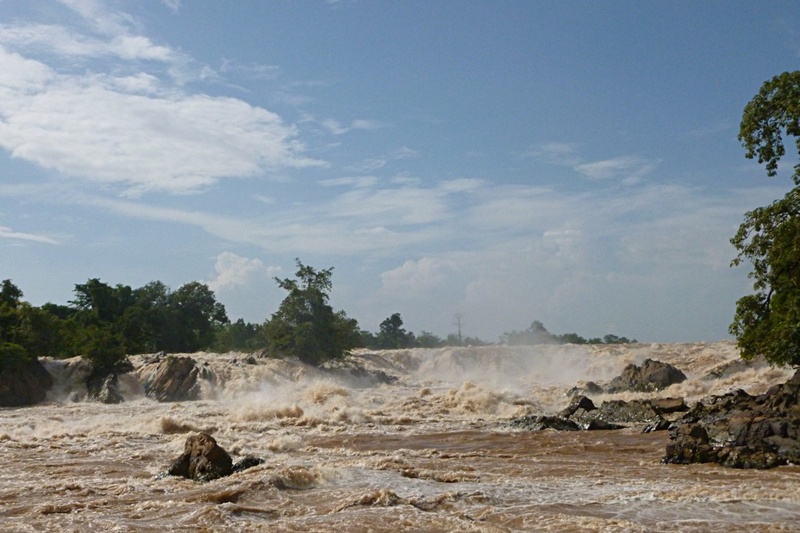 The tour led us east of Don Det and Don Khone. 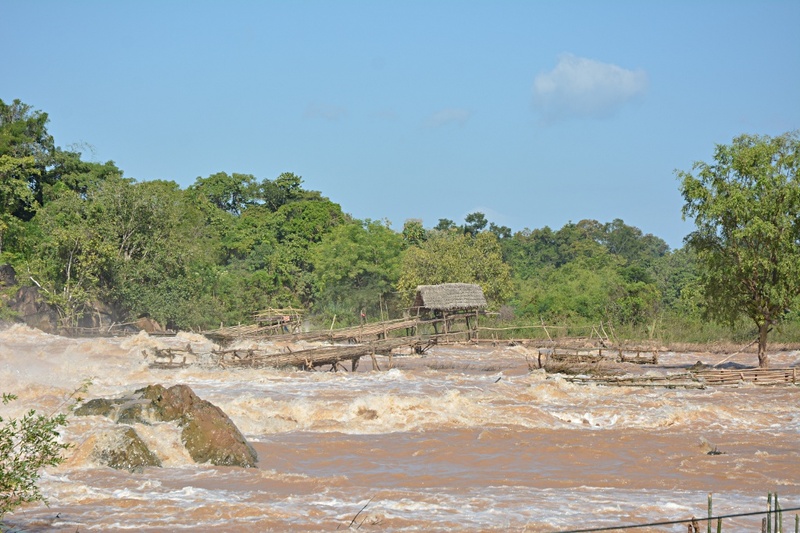 We first had to get out of the water in the eastern shore of Don Khone due to the waterfalls. We once again visited the waterfalls near Don Khone Pasoy and managed the distance down to the re-entry place on foot. South of Don Khone finally we tried to spot the famous dolphins and saw at least a few moving around in in the water. As any other wild animal, the Irrawaddy dolphin does not work according to a schedule set up by some tour company. After lunch we crossed this part of the Mekong river and continued our journey further downstream until we reached another small pier where we pulled the kayaks out of the water and loaded them onto a songthaew. On the road we reached our next destination, the huge Khone Phapheng waterfalls. Apparently the waterfall is the largest in South East Asia although we are not quite sure which criteria are used to determine the size. Once everyone had shot enough pictures we returned futher upstream on the mainland to a place north of Don Det, such that we could cross the river and still hit Don Det despite the currently strong currents. Once again tired but happy we reached our bungalow from where we once more enjoyed the sunset across the river from our patio. This entry was posted in Destination: Uncertain, Travels and tagged 4000 Islands, Bolaven Plateau, Irrawaddy Dolphin, Laos, Pakse, Southern Laos by Oliver Meili. Bookmark the permalink.